← You can just tick along. That’s fine. Your choice. I’ve just finished reading Making Ideas Happen by Scott Belsky; an inspirational book full of practical advice based on real experiences of the challenges and joys of making ideas happen. 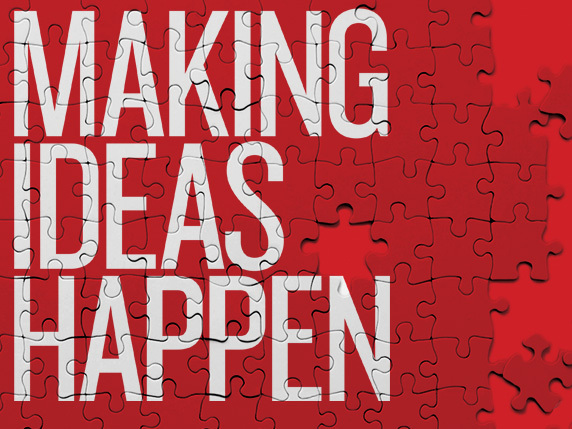 As Scott rightly points out, having ideas isn’t the real problem; it’s making them happen. Ideas don’t happen because they are great or by accident. They happen because people make them happen. And there is a formula. back-burner items; not for now, but someday; idea for a new training course or pitch for a client Organise everything in these three categories to move projects that matter forward. Communal forces Ideas do not happen in isolation, (also see Stephen Johnson’s Where good ideas come from) you must build your networks, work with the people around you, tap into their energy, ask for their help in building, refining and broadcasting your idea, get their feedback and reciprocate. This will help your idea gain traction. Leadership This is the ability to inspire others. 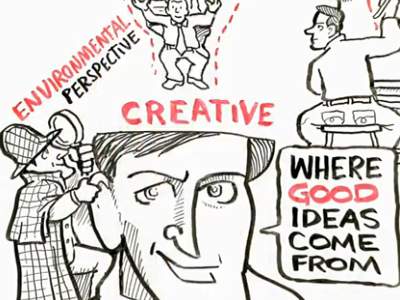 Your ideas will thrive with you as a creative leader. There are challenges to this; it requires a mindset and a personal resilience to help you overcome obstacles along the way to making your idea happen. Actually taking action or ‘shipping’ as Seth Godin names it in his excellent book Linchpin, is one of the biggest challenges. Having the ability to close down the ‘lizard brain’ that feeds on fear to stop you shipping things and causes you to sabotage your progress by having….. another……. meeting… (sound familiar?) is a skill that leaders must work hard at. I love this book because there are many practical tips to help you make your ideas happen, my favourite tip is keeping an eye on the backward clock… and also the many stories including the Purple Santas. Most ideas never happen. I challenge you to defy the odds and work hard to become a person whose ideas happen. If you can do this you will be at a huge advantage. This entry was posted in book review, coffee, conversation, creativity, ideas, Innovation, Inspiration, leadership, passion and tagged action, backburner, backward clock, behance, challenge, communal forces, creativity, fundraising, ideas, ideo, Innovation, Inspiration, leadership, linchpin, make ideas happen, perspiration, purple santas, references, scott belsky, seth godin, success, together ideas happen. Bookmark the permalink.